Classicist and translator Stanley Lombardo will read from his translation of Homer’s Odyssey in a live teleconference, December 14, 2009, 8:00 PM EST. Lombardo is a brilliant translator and masterful reader. What Homer says of the poet Demodocus in the Odyssey — “He made them see it happen” — is true, I’d say, of Lombardo. I am writing from Studio 360, the public radio show devoted to the arts and culture. On our blog, we recently posted an audio clip of Glenn Gould talking to music critic Tim Page. . . . The clip is of an interview recorded for WNYC six weeks before Gould’s fatal stroke. It is most likely his last interview ever. With Gould assuming the part of the fictional movie actor Sir John, it’s very bizarre. But Gould also talks at great length (fifty minutes) about his music. Perhaps your readers will enjoy hearing it. There was. There is. It was. It is. Twenty-five years ago today, Elaine and I were married. Looking at the photographs, I am convinced that we were in our mid-teens. (Though we were in fact in Massachusetts.) How could we have known what we were doing? Who knows. But we were and are so lucky to have found one another. Here’s an icon from an online map of local criminality. Can you guess the crime? Note the circled B. But of course you can begin a sentence with a conjunction. Some may believe this advertisement to be mere gimmickry, but I believe every word. 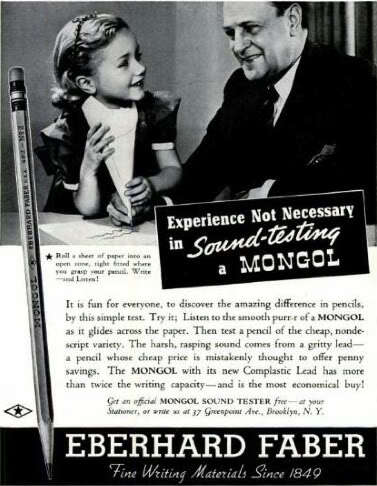 My Mongols purr-r as the ad promises. 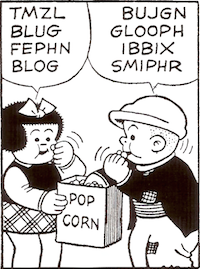 They even speak the occasional Mkgnao!, like Leopold and Molly Bloom’s cat in Ulysses. Cheap, nondescript pencils? They just cough and sputter everywhere. It’s a mess. See the Brooklyn address? Forgotten NY reports that Eberhard Faber was in Greenpoint (“Greenpernt”) from 1872 to 1956. FNY has photographs of Eberhard Faber buildings on Greenpoint Avenue and Franklin Street (scroll about a quarter of the way down the page). Mongol fans: note the Diamond Star in the second photograph. 風呂敷, furoshiki, a type of traditional Japanese wrapping cloth . . . frequently used to transport clothes, gifts, or other goods. I’ve created what you might call a “mottainai furoshiki.” The Japanese word mottainai means it’s a shame for something to go to waste without having made use of its potential in full. The furoshiki is made of a fiber manufactured from recycled PET bottles, and has a birds-and-flowers motif drawn by Itoh Jakuchu, a painter of the mid-Edo era. The above chart comes from Japan’s Ministry of the Environment. Note the tag in the lower-right corner. Once again, it’s — not its — National Punctuation Day. There’s a new documentary about Glenn Gould, Genius Within: The Inner Life of Glenn Gould, directed by Michèle Hozer and Peter Raymont. Considering how reclusive Gould was, it’s remarkable how much footage of him exists, including home movies here of him cavorting in the Bahamas with island girls. Who knew? A new voter-registration card came in the mail today, and like they say, it’s broken. It happened during a class on the Odyssey yesterday, when a student pointed out that there was a large bug right next to me. “I don’t care. I’m not afraid of some bug,” I replied. Then someone pointed out that I had just stepped on said bug. I looked down and saw a large fly, nearly dead. And a teachable moment. “That bug is to me as Odysseus is to the Cyclops Polyphemus,” I said. “No, wait — that means he’s going to defeat me." Then I bent down as if to look more closely. Eudora Welty’s self-portrait is one several hundred self-portraits by actors, artists, athletes, booksellers, musicians, photographers, publishers, and writers, all to be auctioned on September 24, 2009. They are from the collection of Burt Britton, a co-founder of the New York bookstore Books & Co. The starting bid on Welty’s self-portrait: $1000. My daughter Rachel has pointed her parents to Paleo-Future, a site offering “A look into the future that never was.” The woman in the above photograph is a woman of the future. 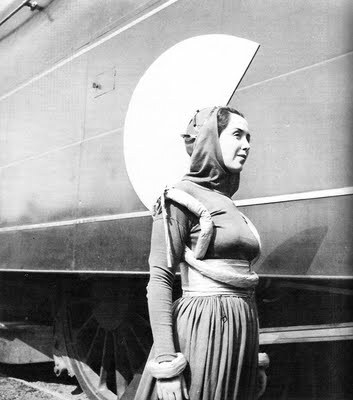 She appeared in the play Railroads on Parade at the 1939 New York World’s Fair. That half-circle, I finally realized, is part of her garb. Note the shadow that it casts on the train of the future. Bob Herbert’s latest column, which here quotes John F. Kennedy, says what must be said. When Elaine and I suggested to an aide of Congressman Timothy V. Johnson (R, Illinois-15) that Johnson and other principled Illinois Republicans might make a statement to address the claims of those who dispute President Obama’s citizenship, the aide claimed to have no idea what we were talking about. Birthers? Huh? He’s in today’s New York Times crossword, a wonderful and surprisingly do-able puns-and-anagrams puzzle by Mel Taub. When I first scanned this quiz, I wondered, where’s Allen Ginsberg? Where’s Jack Kerouac? Wrong ads. Ginsberg and Kerouac wore khakis, in Gap ads. Though yes, they too thought different [sic]. Can you name the people from Apple's “Think Different” ads? Because mistakes can strike anywhere! 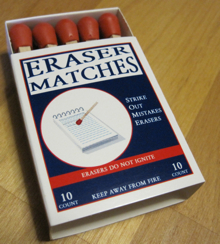 These Eraser Matches (yes, real) were a gift from my son Ben. Thank you, Ben! The words “all time” play such an odd role in pop culture. Rolling Stone is a prime offender: its list of the 500 greatest songs of “all time” begins in 1949, with Hank Williams’ “I’m So Lonesome I Could Cry.” We are the world, I guess; nothing before “us” counts. If the “videos” in Kanye’s proclamation are synonymous with “MTV,” “all time” extends from August 1, 1981 to September 13, 2009. I walked into Jon’s Pipe Shop, where for three years or so I bought tobacco and cigarette papers. Lorraine, Jon’s mother, was still there working. Did they still have Old Holborn tobacco? Yes, of course. But the packages were skinny little versions of the real thing, and each contained nothing more than a ballpoint-pen refill. And Abadie papers? Yes, of course, but they could only be had from “the warehouse.” So I walked out into an empty cityscape, something like the opening scene in The Asphalt Jungle. I found the warehouse door and knocked. No answer. End of dream. My family will be happy to know that even in dreams I still haven’t smoked the dang things. And they will attest that the ballpoint refills make sense. When I stopped smoking, pens and pencils became for me the new cigarettes, new objects of consolation. I learned this morning that Lorraine Callaghan died last year at the age of ninety-three. She was a lovely lady. Thanks again, Rachel and Ben, for getting me started writing online. Thanks, Elaine, for your constant encouragement. Thanks, everyone, for reading. Students have three papers to write. Students in one class make their own deadlines. Students in a second class are given one deadline for all three papers: the last day of class. Students in a third class are given three deadlines for the three papers: the fourth, eighth, and twelfth weeks of classes. Which class gets the best grades? Dan Ariely recounts such an experiment in what looks like a worthwhile book, Predictably Irrational: The Hidden Forces That Shape Our Decisions (New York: HarperCollins, 2009). Ariely is the James B. Duke Professor of Behavioral Economics at Duke University. If the answer to the above question isn’t obvious: the class with three teacher-imposed deadlines had the best grades. And yes, the class with the last-day deadline had the worst grades. But a further question: which class and teacher would most students think the coolest? 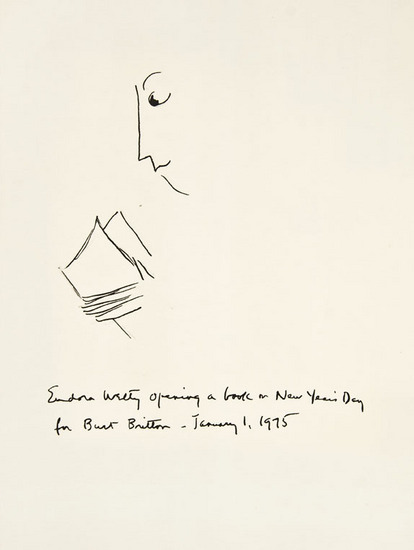 Here is the illustration that furnished what E.B. 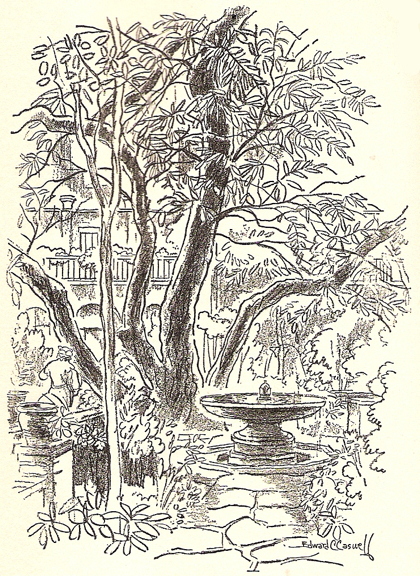 White called “the tailpiece” for his book Here Is New York (1949). This tailpiece is missing from the 1999 edition (titled Here is New York). Illustrator Edward C. Caswell (1879–1963) did many New York scenes for the weekly New York newspaper The Villager. Three of those works are for sale at the Deep Archives. Thanks to Benjo, who found a 2002 New York Times article about the willow tree in this illustration. The tree was still standing in 2002, in the (private) Turtle Bay Gardens, between East 48th and 49th Streets. All dwellers in cities must live with the stubborn fact of annihilation; in New York the fact is somewhat more concentrated because of the concentration of the city itself, and because, of all targets, New York has a certain clear priority. In the mind of whatever perverted dreamer might loose the lightning, New York must hold a steady, irresistible charm. . . . This race — this race between the destroying planes and the struggling Parliament of Man — it sticks in all our heads. The city at last perfectly illustrates both the universal dilemma and the general solution, this riddle in steel and stone is at once the perfect target and the perfect demonstration of nonviolence, of racial brotherhood, this lofty target scraping the skies and meeting the destroying planes halfway, home of all people and all nations, capital of everything, housing the deliberations by which the planes are to be stayed and their errand forestalled. A block or two west of the new City of Man in Turtle Bay there is an old willow tree that presides over an interior garden. It is a battered tree, long suffering and much climbed, held together by strands of wire but beloved of those who know it. In a way it symbolizes the city: life under difficulties, growth against odds, sap-rise in the middle of concrete, and the steady reaching for the sun. Whenever I look at it nowadays, and feel the cold shadow of the planes, I think: “This must be saved, this particular thing, this very tree.” If it were to go, all would go — this city, this mischievous and marvelous monument which not to look upon would be like death. E.B. White, Here Is New York (New York: Harper & Brothers, 1949), 50–51, 53–54. Congressman Joe Wilson spoke briefly to reporters this morning, looking and sounding like a kid who’s just been to the principal’s office. Well, that’s what happens when you act up during a school assembly. Watch and listen as Wilson meets the press. Do you notice something missing? What I notice is not the absence of “I apologize,” not the absence of “I’m sorry”: what’s really noticeable here is the absence of any reference to President Obama by name. Note what Wilson says at 2:07: “When he stated, as he did.” There’s no earlier mention of President Obama in these remarks. Is it too much to expect Wilson to refer to the president by name? I don’t think I’m making too much of this bit of reference. To omit a name often implies contempt. Remember John McCain’s “That one”? I’m reminded too, rightly or wrongly, of the way in which kids when angered and upset will refer to the offending parent only by pronoun: “Mom, he’s not being fair!” I think that any parent or child from a pronoun-using family can confirm this observation. In other news, a website for Congressman Wilson’s Democratic opponent Rob Miller has raised $133,399 since last night. Correction: $133,424. Let’s hope that Congressman Wilson can try harder to behave, by showing courtesy to others and not interrupting. Speaking more seriously, I’ll note that Obama’s refusal to be rattled (“That’s not true” was his only response) offers a useful model for any teacher contending with disruption and rudeness. Keeping cool is the only way to go. Van Dyke Parks is the keynote speaker at the Big Sound 2009 music conference in Brisbane, Australia. At The Pen Addict (“. . . there are WORSE addictions, right?”), there’s a carnival of pens, pencils, paper, and supplies. Ink! Staplers! And a 1945 Westinghouse pocket diary! I’m honored to see that my July post on Fineline erasers is part of the fun. Notebook Stories curates this monthly carnival. Read the whole piece, and imagine being a young person and listening to a grown-up talk to you with such unalloyed honesty and hope. Letters allow me to think out loud in a way that a journal, with its audience of one, can’t. Even without a dialogue, I can imagine my audience’s reaction, just as perhaps John, Abigail, and the other assorted family members thought of each other centuries ago as they sat at their desks, dipped their quills, and looked out over the bleak fields of winter and the ripening fields of summer. Rod Blagojevich has a book coming out tomorrow, with the reality-resistant title The Governor. The other words on the front cover, perhaps not an official subtitle: “Finally, the Truth Behind the Political Scandal That Continues to Rock the Nation.” Is the scandal, from Blagojevich’s perspective, his wrongdoing, or his impeachment? It’s doubtful that either one rocked, much less continues to rock, the nation. As his recent Elvis impersonation suggests, the ex-gov has difficulty rocking even the house. He’s now the president of the United States, like Zeus in Greek mythology, on top of Mount Olympus. I’m Icarus, who flew too close to the sun. And I crashed to the ground. Uh, no. Icarus fell into Lake Michigan and was never heard from again. [I]t was our office archaeology that I remember the most. There was a primitive chaos to it all — the hybrid scent of tobacco and mimeograph ink, and the sounds of ringing phones, of typewriters zipping along until the warning bell pinged near the end of a line, and of the clack-clack-clack of the return handle as the carriage reset. I like using a thrift-store rotary telephone in my office; the ring is startlingly loud and delightful, even though I should know by now to expect it. (Thanks for my phone, Rachel and Ben!) A diehard might bring back more lost sounds with the 1964 Folkways recording The Sounds of the Office (still available from Smithsonian Folkways). Alas, there’s no easy way to recapture the deep purple fragrance of fresh mimeographing. It is unusual to hear musicians in their fifties and sixties and seventies introduced as “the cutting edge,” but the description is indeed accurate. The Association for the Advancement of Creative Musicians, of which Muhal Richard Abrams (b. 1930) is a co-founder and of which George Lewis (b. 1952) and Roscoe Mitchell (b. 1940) are distinguished members, represents still, at least to my ears, the last giant step (or two or three steps) forward in jazz composition and performance practice. At a time when the word “jazz” is for many people synonymous with, say, Diana Krall or Wynton Marsalis, terms like “cutting edge” and “experimental” can serve to enforce artistic marginalization. I remember being told, only a few years ago, that Charles Olson was an inappropriate choice for a student of postwar American poetry: “He's not mainstream!” Well, that depends on where you’re standing. I doubt that the radio personality who introduced Messrs. Abrams, Lewis, and Mitchell as “cutting edge” last night has played their music on the air. 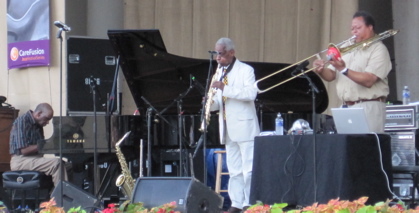 But I’m happy that the Chicago Jazz Festival brought the trio to Grant Park and honored Abrams as the festival’s artist-in-residence this year. The Trio played one nearly hour-long spontaneous improvisation last night. It might be more appropriate to think of these musicians as a quartet, with Lewis’s MacBook Pro as the fourth voice. 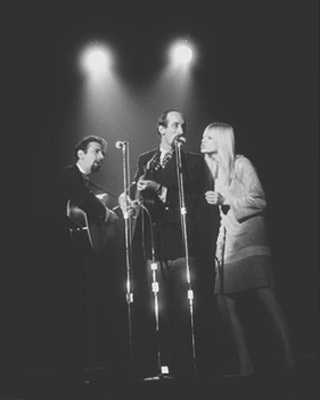 The group’s performance was a matter of uncompromised concentration — no grooves, no riffs, no tunes, nothing to fall back upon beyond a resourceful attention to the moment, developed through years of practice. The performance began with a lacy piano figure. A duet for alto and piano followed, with foghorn-like accompaniment from Lewis’s Mac. A muted trombone statement followed, while Mitchell sustained notes via circular breathing. Then a open-faced trombone solo, with traffic-like sounds from the Mac. Sometime later, Mitchell repeated a single long tone on flute as Abrams and Lewis raced around him. 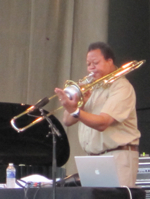 An Abrams solo passage suggested an atonal, swirling version of boogie-woogie piano. Later still, an alto solo against jungle noises. Not long after that, a slightly raucous balladic interlude for alto, trombone, and piano. Near the end, a strange and wonderful moment in which it was impossible to tell whether faint engine and exhaust noises were the work of Lewis’s Mac or Chicago. The close was unexpectedly beautiful and apt, with the Mac producing a repeated percussion figure and what sounded like train engines, while the three musicians sat as an audience at their own performance. And then Abrams plucked a repeated high note on a piano string. The train had left the station. A coda: on our way back to the underground municipal parking garage, we heard on Michigan Avenue the beginning of a performance by a chorus of young people representing Mennonite Innercity Evangelism. I wonder whether they too had come up to Chicago from downstate Illinois. George Lewis’s A Power Stronger Than Itself: The AACM and American Experimental Music (Chicago: University of Chicago Press, 2008) tells the story of the AACM. Cartrain, a 17-year-old graffiti artist embroiled in a feud with Damien Hirst, has been arrested after stealing pencils from the millionaire artist’s latest installation. . . .
Cartrain visited Hirst’s installation Pharmacy in July, which was being shown as part of Tate Britain’s Classified exhibition until it closed last month, and removed a few of the rare “Faber Castell dated 1990 Mongol 482 Series” pencils. Cartrain then created a parody police poster. According to the real police, the Metropolitan Police, the pencils, part of a £10 million installation, are worth £500,000. £500,000 for Mongols? It’s not as if they’re Blackwings. He always smoked a lot of cigars. Typically, you would see him behind the counter with his foot up on a low shelf, puffing away, completely satisfied. He was always completely free of worry. Honestly, he never seemed to be preoccupied with anything. I was just the opposite. I was always worried about everything. One day when I was about ten, I asked him about it. He had a friend, little Ike. They both loved cigars and they were inseparable. They didn’t talk much, but they liked being together. Ikey was out of work most of the time, but somehow he could afford those cigars. He actually paid Little Ike to worry for him, and that was how Ike could afford his cigars. It was what you call a symbiotic relationship. Jeff Kisseloff, You Must Remember This: An Oral History of Manhattan from the 1890s to World War II (Baltimore: John Hopkins University Press, 1999), 64–65. Outsourcing worry! I wish I’d thought of it. But whom to hire? How much to pay? And how to be sure the job would get done? [Note: A comment from Howard Henner on a 2008 New York Times egg-cream story states that Louis Auster’s original recipe for chocolate syrup is known now only to Henner and his cousin Stanley Auster. Stanley Auster, I take it, is still with us. I wish I knew where I learned about Jeff Kisseloff’s book, a few months ago. Parks is of course borrowing from William Wordsworth’s “Ode: Intimations of Immortality.” Wordsworth is also a source for “Child Is Father of the Man,” from the Wilson–Parks collaboration SMiLE. Van Dyke Parks is a speaker at the Big Sound 2009 music conference next week in Australia. I consulted the Oxford English Dictionary, hoping for a history of the word rich and strange. But no. The verb steps on stage in the 1790s: “A euphemistic substitute for DAMN.” The noun follows in 1906: "A damn, cuss." A few sample sentences, and that’s it. If anyone knows a good remedy to remove the Schaefer jingle from a human head, please advise. The clue for 18 Across in today’s New York Times crossword — “‘The one beer to have when you’re having more than one’ sloganeer” — brings back the past. The answer (in crossword caps): SCHAEFER. Why did the doctor tell the expecting mother to drink Schaefer? Because she was having more than one. That’s funny — in at least a couple of ways. But Mrs. Vistreich was not amused. I was already on her bad side, being a clock watcher, staircase talker, and whistler. The joke didn’t help. No joke. So complete is each neighborhood, and so strong the sense of neighborhood, that many a New Yorker spends a lifetime within the confines of an area smaller than a country village. Let him walk two blocks from his corner and he is in a strange land and will feel uneasy till he gets back. Shopkeepers are particularly conscious of neighborhood boundary lines. A woman friend of mine moved recently from one apartment to another, a distance of three blocks. When she turned up, the day after the move, at the same grocer’s that she had patronized for years, the proprietor was in ecstasy — almost in tears — at seeing her. “I was afraid,” he said, “now that you’ve moved away I wouldn’t be seeing you any more.” To him, away was three blocks, or about seven hundred and fifty feet. From Here Is New York (New York: Harper & Brothers, 1949), 29–30. This essay in book form would be a wonderful gift for anyone hailing from or headed to the city. Never mind that White was writing in 1948. As he says in a foreword, the New York that he has described had already become a matter of the past by the time his book was published. It’s the reader’s job, he says, “to bring New York down to date,” though in a final dark meditation on Manhattan’s vulnerability to attacking planes, White has done the job for us. 1. Click on Tools, then Error Console. Or install the “experimental” extension Vacuum Places Improved, which does the work for you on a regular basis. It is often useful that these kinds of formulas have a fixed scale of element sizes beforehand. . . . However, it does occur that sometimes it is hard to see things even if they are exactly the planned size and in the place marked by the guidelines. It’s even better though to correct typos. Jardí’s advice is worth reading, but this book in its present form isn’t worth $24.95. Better to borrow (as I did) from a library.